Do You Have Sun Damage on Your Chest? Get Rid of the Sun Damage! Years of sun worship has given you a deep-golden tan that is the envy of your friends. Unfortunately, all this sun worship has left you with spots, freckles and a crepe skin texture. This sun damage is often most noticeable on the chest and can really show your age. While a complete reversal of the sun damage is unrealistic, there are technology innovations that can help refresh and rejuvenate your damaged skin. With the expert help of our medical providers at Noydeen Beauty, we treat our clients with laser light technology. Laser light therapy is a non-invasive therapy that uses light energy to repair and regenerate skin cells. The procedure reduces the need for medication, improves the outcomes for treated skin conditions and increases the recovery rates of affected tissues. Unlike surgical treatments that requires incisions, laser treatments use light to break down sun damaged tissue and trigger healthy new tissue production. The sun damage will become more even in color and texture and it will blend more naturally into the surrounding skin. The sun damage treatment at Noydeen Beauty is a noninvasive procedure and can take as little as 20 minutes per treatment to perform. With proper treatment cycles and skin care post treatments, our clients can expect dramatic improvement in the appearance of their sun damage to a point where they are barely visible. Dr. Ali and his team at Noydeen Beauty first assesses your skin using the Skintel® Melanin Reader, which precisely measures your skin tone and the melanin density in the treatment area. These readings enable Dr. Ali to choose treatment settings with accuracy unmatched by the much more subjective methods used in the past. What types of sun damage can be treated? 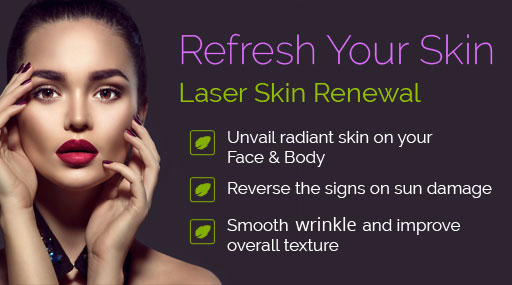 Sun damage laser treatments are designed to treat surgical and acne scars on any area of the body including the face. Sun damage laser treatments can be safely used on most skin types. During your consultation, Noydeen Beauty will determine if you are a good candidate for the procedure based on a variety of factors.